I have been on a mega scone kick lately. 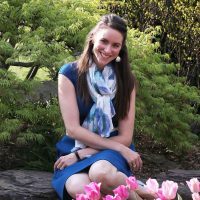 It all started a few months ago when I got together with several of my work friends for brunch. I brought cinnamon swirl scones…and loved them so much that I made them again the next day. And then I made scones again the week after that. And then it was clear that I was obsessed. I first became interested in scones after a trip to England a bit over a year ago. I had seen several references to scones with clotted cream on cafe menus, but somehow I never managed to try them (maybe because the word “clotted” doesn’t strike up a lot of confidence within me…). 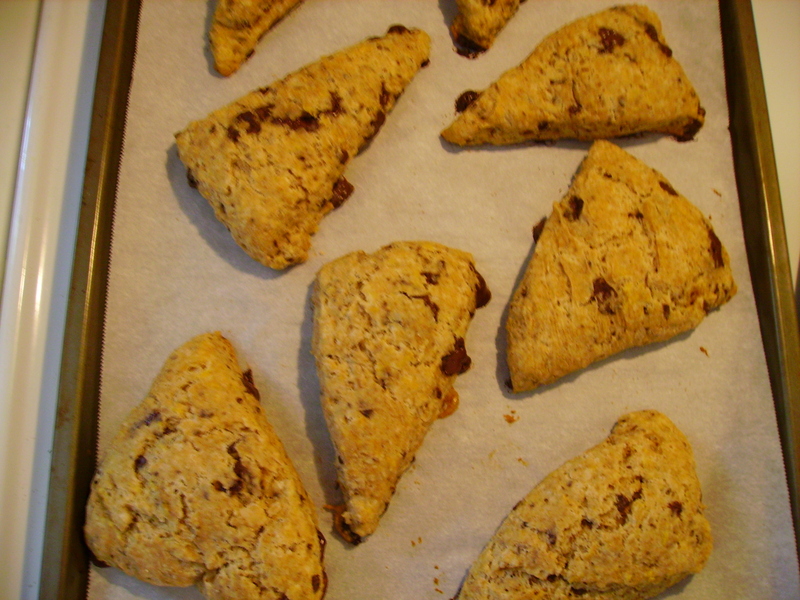 But when I began my recipe project, making the perfect scones was high on the list. I tried to make clotted cream, too, but after several lengthy and failed attempts, I gave in to the cold truth that the right kind of cream (unpasteurized) is simply not sold in the U.S., and you can’t make proper clotted cream without it. The good thing that came out of all that disappointment was a fantastic recipe for scones, compiled from a lot of reading and several different recipes. Scones are a great treat for any time of day (as I proved to myself repeatedly during my manic scone-making phase); the only problem is that they are not exactly the healthiest baked good on the block. So when I was tasked with bringing snack to one of my MEd classes, I decided to tinker with the scone recipe I usually make and try to improve its health factor. The result? 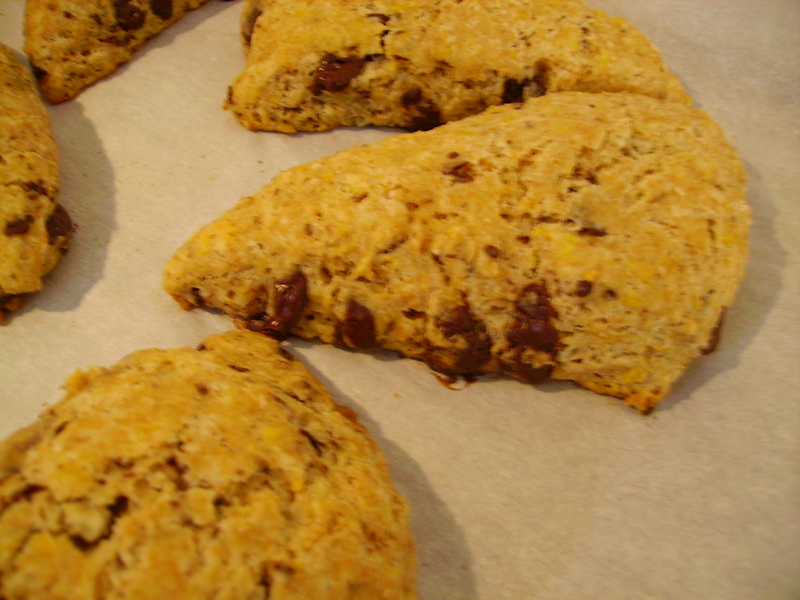 A lightly spiced scone that doesn’t feel overloaded with crunchy-granola-whole-graininess, laced with orange zest and spotted with extra bittersweet chocolate. Yum. (Yes, I do realize I violated my fruit rule…but I think the sweet citrus really sings against the nutty whole wheat flour.) It’s true, these scones are still filled with butter, but I like to think the whole grains make up for the elevated fat content. Or maybe I’m just deluding myself. The scones are worth it. First, mix together all your dry ingredients. Don’t skimp on the spices! I am such a big fan of cardamom, and once I pop that lid and smell it, all gingery and spicy and lemony, I can’t help but add extra. You should, too! If you’re anything like me, sometimes you might get a recipe started the night before, just to save some time in the morning. But if you decide to mix the dry ingredients together the night before, make sure you save the zesting for baking day, so it doesn’t dry out. Add in your buttermilk and vanilla (I accidentally added an extra ¼ cup of liquid here, so you can see my dough is very wet–I just added extra wheat flour during kneading until the dough wasn’t completely sticky). After the liquid is partially combined, add your “mix-in.” One of the girls in my class has a nut allergy, so I chose 70% dark chocolate for this batch, but using pecans is a great way to add heart-healthy fats and decrease calories. Once mixed, turn the scones onto a lightly floured board and knead a few times to work in the extra flour crumbs and build up some flaky layers. Pat into a large rectangle and cut into 16 triangles. Et voilà! My classmates loved these, and you will, too. 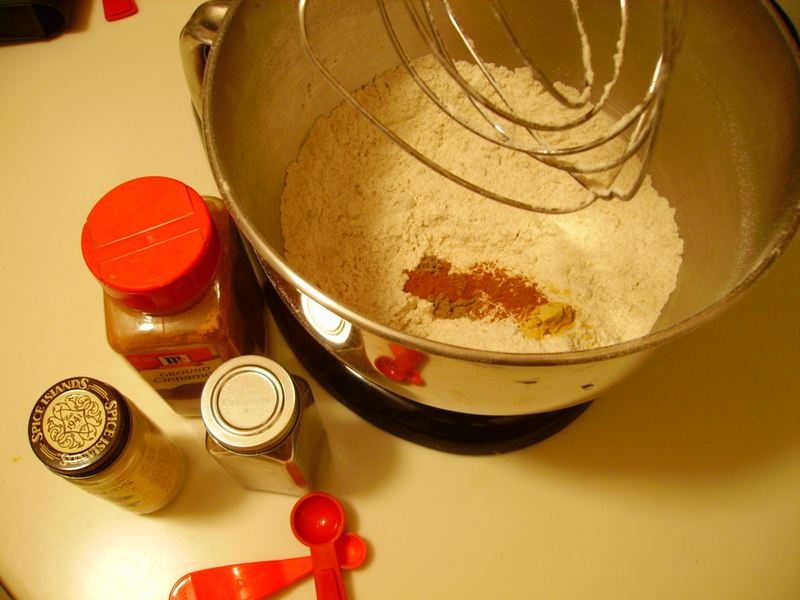 In a large mixer bowl, whisk together the dry ingredients. Remove butter from freezer and grate it into the bowl. Using a pastry cutter, cut the shaven butter into the flour mixture very gently. 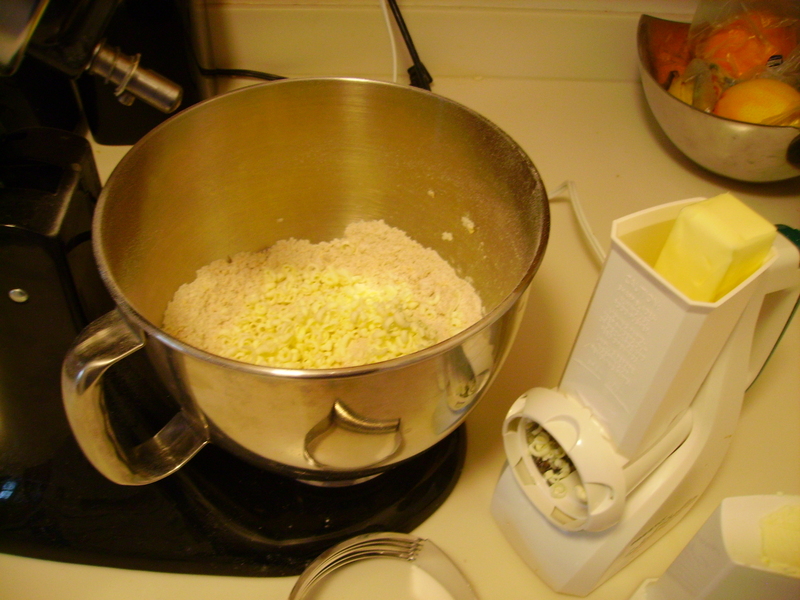 The mixture should form crumbs; do not overwork or the butter will become too soft. Mix together buttermilk and vanilla. Pour into the flour mixture. 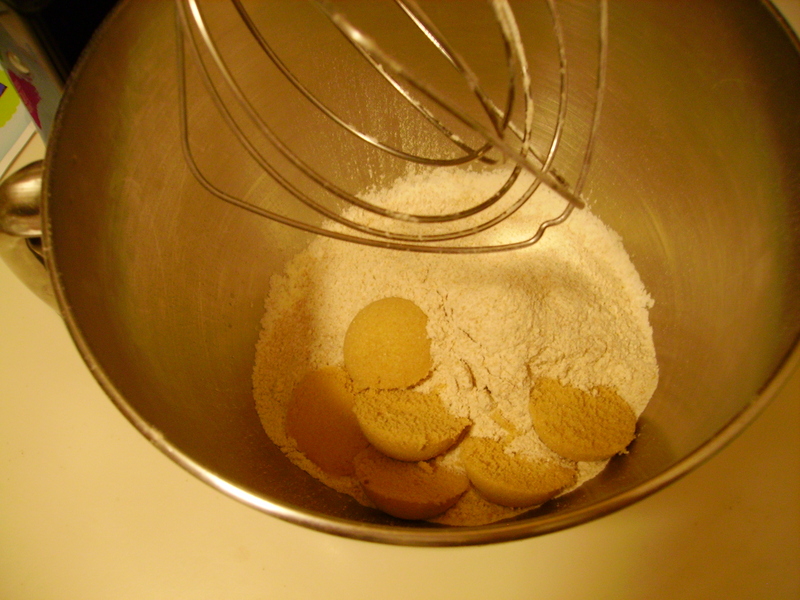 Using the whisk attachment on the mixer, stir slowly together. Add in the mix-in. Scrape and stir again. 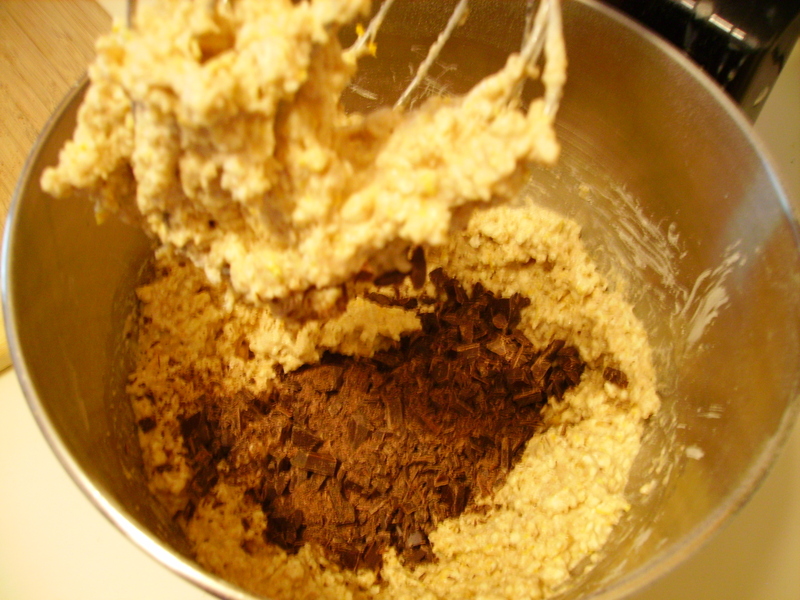 Do not overmix, even if there is extra flour not mixed in. 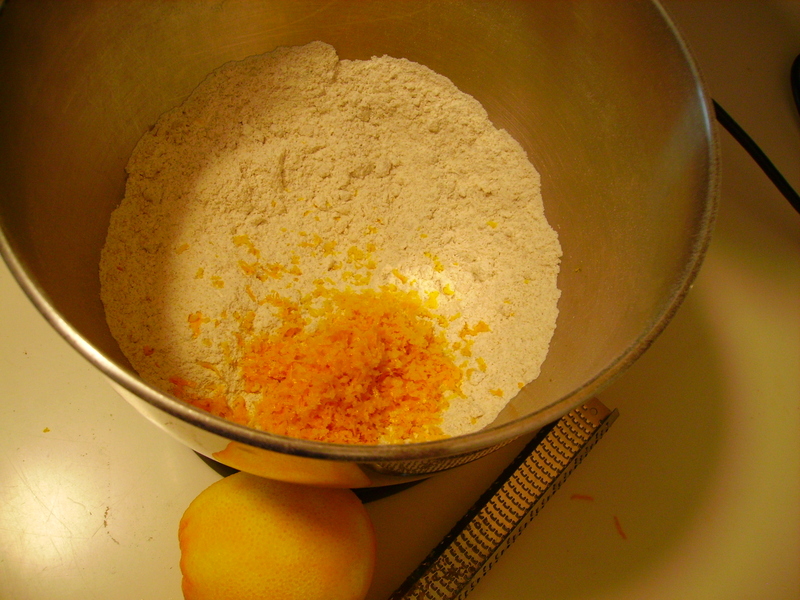 Turn contents of mixing bowl onto a cutting board and knead 4–5 times, working in the extra flour. Overworking the dough will produce tough scones, so be gentle and don’t stress about a few extra crumbs of flour that aren’t mixed in. 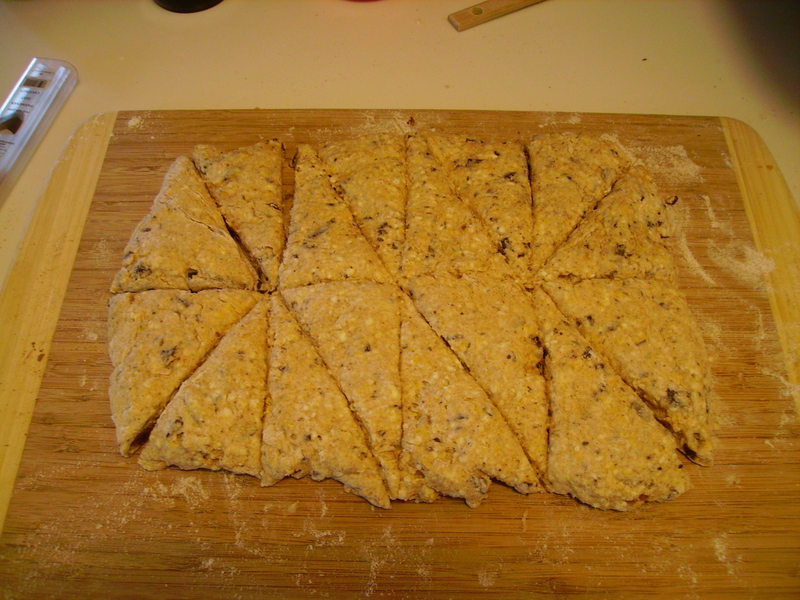 Form the dough into a large rectangle about 1½″ thick and slice into 16 equal triangles. Place scones on a parchment paper–covered cookie sheet and bake 15–18 minutes, or until the scones feel firm when gently pressed on top. Immediately remove to a wire rack to cool. *Note: For a slightly more wholesome-tasting scone, increase the ratio of whole wheat to all purpose flour. Whole wheat flour requires more moisture, so add a few extra tbsp. of buttermilk to accommodate the increased fiber. Ohmygosh – scones with clotted cream are the best thing ever! If you haven’t had a chance to try it yet, you can buy clotted cream in the fancy cheese section of most grocery stores – next to the creme fraiche. I love the combo of chocolate and orange – I will have to try these!